You can get a set of Innova tires for half that, but they won't last if they see any pavement because they aren't carbide. You never know what the conditions are in the woods until you get there (ice/snow/dirt), studded tires are awesome if you are lucky enough to live where there's ample opportunity to need them. To summarize the wisdom a local (Morgantown WV) old pro - studded tires are only good in ice, and unless the conditions are pure ice, ride your MTB with the widest tires you can squeeze in. 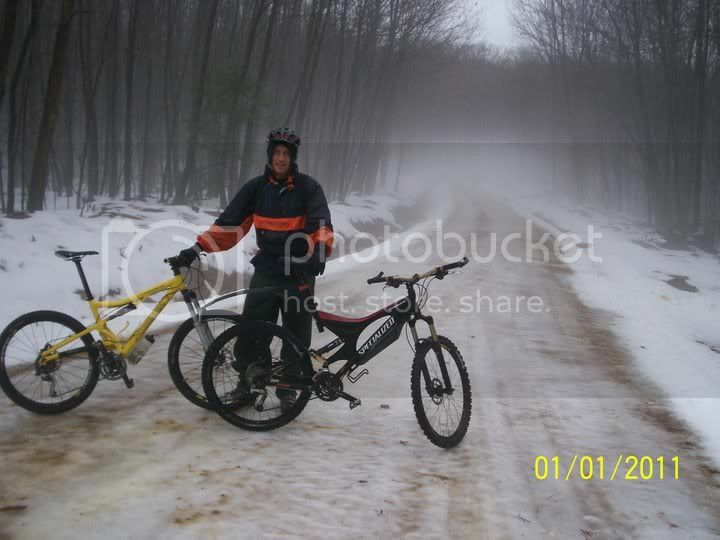 I've done fine on my CX bike this winter with limited snow, and my 29er MTB has been good in all conditions. Post pics of any DIY stuff you come up with. 50 studs, .3" from the tire centerline, zig-zag pattern (find knob pattern on the tire that will keep things spaced evenly - drill through knobs). The hardest part is keeping the bolt heads insulated from the tube. Hot glue on the heads of the bolts, 3-4 passes of duct tape, and slime tape ( http://www.slime.com/product/211/Slime- ... ctors.html ) kept me rolling for a winter season without too much trouble. Never slipped with these, and with the studs sticking out .2" past the tire, they pushed through the snow with ease. Not really asphalt friendly like the manufactured snow tires. Very little rubber touches the ground. I was able to make pretty hard cuts on a frozen pond tho...Thom, you shouldn't have too much trouble making it up your icy hills.. I think I will try a DIY before tossing down a $100 for a pair. I just don't know how much I will ride em.. and can't see spending that kind of cash..., that's more than what I spend on my season rubber. perhaps I will regret it... whether successful or not, I will post my outcome. I made a set a long time ago when Kissing Bridge would have the race in the Terrain Park. I would just buy a set, it took a long time and they didn't work all that well.